The Covent Garden Theatre was the most luxurious ever built in London. Opened in 1732, it was destroyed by fire in 1808, along with Handel's piano and some of his manuscripts. 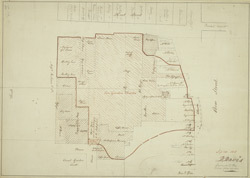 This plan shows the extent of the destruction. It was surveyed by D. Davis, 'Surveyor to the Phinex Fire Office'.